My orientation and initial fitness evaluation revealed that I weighed 237 pounds, my Body Fat% was 27.6 and my waist/abdomen measured 45 inches. Eleven months later, I tipped the scale at 173 pounds. Today, my Body Fat% is 10.9 and my waist/abdomen is 32.5 inches. I lost over a foot off of my waistline!" Do you have what it take to get in shape once and for all? Now is the time to find out! 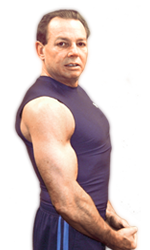 Personal Trainer Directory-Home Personal Trainer Directory. Helping Busy Men and Women get fit in the privacy of their homes. No workout equipment needed.